you are looking for any sharing of elements. These are events that cannot occur at the same time. the probability of A and B, P(A∩B) = 0. Remember that "and " implies "intersection" of the sets. Mutually exclusive sets will not intersect (overlap). Josh must choose Door A or Door B. He cannot go through both doors at the same time. Mutually exclusive. be in one event or the other event is the sum of their individual probabilities. minus the probability of the outcome being in both events. Look out!! Don't get stuck on this one!!! A pair of dice is rolled. What is the probability that the sum of the numbers rolled is either 7 or 11? The sum of the numbers cannot be 7 and 11 at the same time, so these events are mutually exclusive. A pair of dice is rolled. What is the probability that the sum of the numbers rolled is either an even number or a multiple of 3? Of the 36 possible outcomes, 18 are even sums. 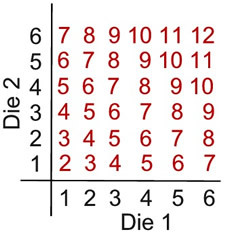 Sums of 3, 6, 9, and 12 are multiples of 3. There are 12 sums that are multiple of 3. The sums that are even and a multiple of 3 are 6 and 12. There are 6 ordered pairs with these sums.